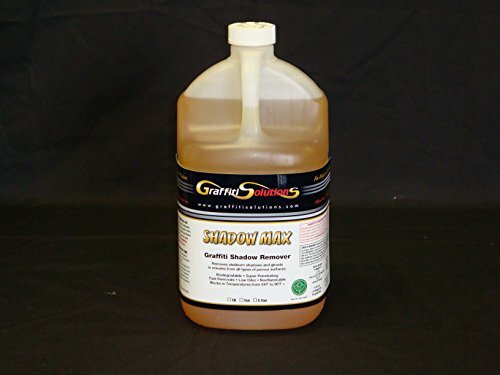 If you are removing shadows or "ghosting" from any porous surface SHADOW MAX is the right choice for the job. Shadows, ghosting or residues that may occur on porous surfaces, after using conventional graffiti removers. These include shadows, ghosts or residues left by spray paint, markers, inks and most other graffiti shadows or ghosts. RECOMMENDED FOR REMOVING GHOSTING OR SHADOWS ON: Brick, mortar, masonry, cement, concrete, stucco, terrazzo, pavers, fieldstone, porous tile. Natural stone surfaces such as granite, marble, sandstone, rocks, both porous/rough or polished. Porcelain, glazed or ceramic tiles, grout. Not recommended for use on metal finishes, plexiglass and Lexan. Super penetrating action for maximum wet out or stubborn shadows and ghosts. Low odor with minimum or no ventilation requirement for added safety, indoors or out. Nonflammable, noncombustible, minimal fire hazard formulary. If you have any questions about this product by Shadow Max, contact us by completing and submitting the form below. If you are looking for a specif part number, please include it with your message.